I live in the South where the summers are very long, very hot, and very humid. Since I try to use my oven as little as possible during these months, I often turn to frozen desserts to satisfy my sweet tooth. While reading Emily Luchetti's book, A Passion for Ice Cream, one recipe that caught my eye was her Dulce de Leche Frozen Yogurt. I love its pretty caramel color and how its texture is light, with a refreshingly tangy sweet caramel flavor. It can be served plain or you can fold in some toasted and chopped pecans or walnuts, or even chocolate chips. It's also very nice with a drizzling of chocolate sauce (recipe here). 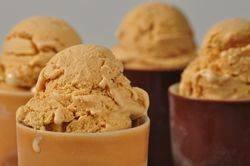 This Dulce de Leche Frozen Yogurt resembles ice cream in texture and it is made like ice cream (that is - churned in an ice cream machine). But unlike ice creams that have a custard base, this frozen yogurt just stirs together plain yogurt, heavy cream, and Dulce de Leche. Now, the texture of frozen yogurt depends on the type of plain yogurt used. If you use 'whole milk' plain yogurt, the texture of the frozen yogurt will be quite thick, like ice cream. If, on the other hand, you use a 'reduced fat' plain yogurt, the texture of the frozen yogurt will be like soft serve ice cream. However, one way to use low fat yogurt, yet still have a thicker frozen yogurt, is to drain the yogurt first to remove some of its liquid. Do this by putting the yogurt in a cheesecloth lined strainer that has been placed over a large bowl. Cover and put it in the refrigerator and allow the yogurt to drain for several hours, or preferably overnight. Dulce de Leche (pronouced DOOL-say day LAY-chay) is a thick, rich and sweet, caramel flavored and colored cream that is made by cooking sugar and cow or goat's milk until it is thick and caramel colored. Dulce de Leche means "sweet of milk" or "milk candy". It is also known as cajeta, arequipe, manjar or manjur, and doce de leite. You can make your own or it is sold in cans, jars (my favorite is the brand LaSalamandra), or tubs and can oftentimes be found in grocery stores, in Latin markets, or on line. Dulce de Leche: In a large bowl, whisk the yogurt with the dulce de leche. Then whisk in the rest of the ingredients until everything is well combined and the mixture is smooth. Cover and refrigerate four to six hours, or overnight. Once the mixture is thoroughly chilled, place in your ice cream machine and process according to the manufacturer's instructions. Once made, the frozen yogurt may still be a little soft. So I like to place it into a covered container and freeze for a few hours before serving. If freezing overnight, the frozen yogurt will become very hard. So place it into the refrigerator for about 30 minutes to soften before serving. Makes about 6-8 servings. Preparation time 30 minutes.